Welcome to SPARS 2017, the 6th edition of the Signal Processing with Adaptive Sparse Structured Representations workshop. As with previous editions, SPARS 2017 brings together statisticians, engineers, mathematicians and computer scientists working in the areas of sparsity-related techniques and computational methods for high dimensional data analysis, signal processing, and related applications. 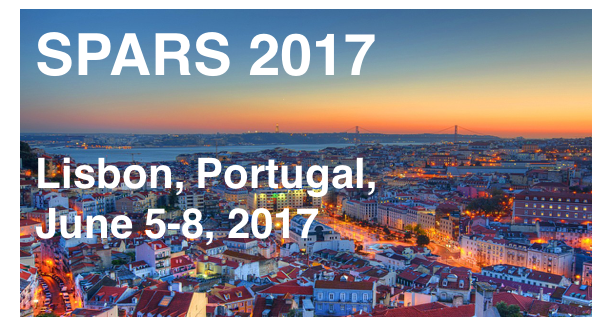 The program of SPARS 2017 features a set of 8 invited talks by renowned experts: Yoram Bresler (University of Illinois, USA), Volkan Cevher (EPFL, Switzerland), Jalal Fadili (ENSI Caen, France), Anders Hansen (University of Cambridge, UK), Gitta Kutyniok (TU Berlin, Germany), Philip Schniter (Ohio State University, USA), Eero Simoncelli (NYU, USA), and Rebecca Willett (University of Wisconsin, USA). SPARS 2017 also includes a single track with 34 contributed oral presentations, and three poster sessions (with a total of 111 posters), as well as a special poster session describing work carried out within two Marie Skłodowska-Curie training networks, SpaRTaN and MacSeNet, which provided financial and organizational support to the workshop. Finally, SPARS has come to Lisbon; we hope you enjoy this great workshop and this beautiful city. Instituto de Telecomunicações and Instituto Superior Técnico, Universidade de Lisboa, Portugal.